Follow @mcphoo Tweet Adam Glass is a Strong Guy. I'd like to put that in perspective: he's a *practically* strong guy. That doesn't mean he's practically as in almost strong, but practically as in "fit for purpose," functional, expressive of same. 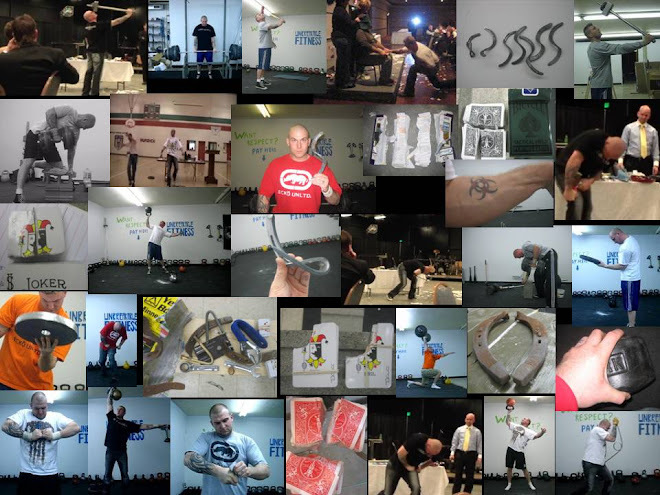 Now, he does lots of cool strength demos, from ripping card decks to bending nails, closing grippers and pressing very heavy things up into the air from the ground, but fundamentally he is a grounded strength and fitness practitioner - all these prac terms practical, practitioner - all speak to expertise derived from lots of practice of skills. I'd like to recommend his blog, Walk the Road Less Travelled, to you because he takes the time to shoot videos of him doing what he does, and he discusses it too. He has a rich section of article from strength training to practical tips on card tearing. Most particularly, i like the videos. They're kinda freaky and inspiring all at the same time. I also like the fact that Adam's gym looks pretty basic - in other words, proving once again we don't need tons of "stuff" to get strong, but it does take practice practice practice. it's just that practice of the right technique works. As Adam Glass demonstrates. Thanks Adam. The next blog i'd like to bring to your attention is Georgie Fear's Nutrition Solutions. Ms. Fear is a registered dietician, trainer and phd candidate. Her site is full of nutritional goodness about the kinds of questions around food most of us have all the time - how much sugar ok; why peas might be worth a second look; isn't diet soda ok? how do you get vitamin d into your diet and why should you care? Why should you trust Georgie's blog? For me, besides listening to her explain stuff in conversation (reflected in this post - just look for her name) on the blog and at the Precision Nutrition forum, she's a Registered Dietician. I only learned this past year that that qualification is a Really Big Deal - lots of university level education, practicums, exams. Where anyone and their dog can call themselves a Nutritionist, the RD really has been trained and is then grilled about knowing their stuff before they get certified by the Commission for Accreditation for Dietetics Education. That she's also now doing a PhD in nutrition suggests a serious interest and commitment to the topic. The style of the blog is well grokable. My guess is you'll be pleased you took a peek and have it as a reference. I am so humbled! Thank you for your kind words.